#CoupleGoals! 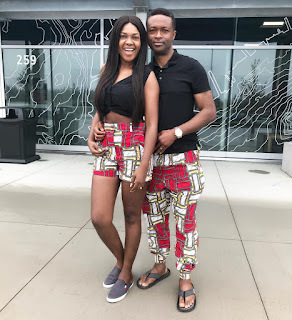 Omoni Oboli and her husband Nnamdi step out in matching #Ankara pants.. Sharing the image of herself and her hubby, the actress and producer celebrating her husband on his birthday shared on how he agreed to wear matching outfits with her without hesitation. Thanks for showing me unconditional love ❤️ Thanks for your devotion, attention and selflessness. My biggest fan! My greatest cheerleader. I won’t be half the woman I am without you! I pray that God does for you all you do for me. I pray good health, soundness of mind, peace, joy, love and all good things for you today and always! It’s your birthday baby but that’s not the story...I’m just chuffed that you didn’t even bat an eyelid when I suggested matching clothes for this pictures 🤣🤣🤣💃🏻💃🏻💃🏻" she shared..